My ancestors from both sides have been farming for ages. Peasants have continuously held this as ancestral as salutary art of nourishing “débrouillardise” (lit. problem-solving creativity) for ages; they have fed others in the plain as in the mountain, under dictatorship as under “democracy”. However, farmer newspapers today say we may disappear soon; ‘eternal’ peasant population rushes to the bottom. Are we really going to disappear? How and why did we get to this situation? What is going on in farms today? What are farmers’ plans and projects? What futures do these projects lead to? This is in short the structure of my MSc-thesis ‘Les Indomptables : An ethnography of niche novelty production in Walloon Agriculture’. This alarming observation motivated me to go and see on farms in order to better see, understand phenomena going on in the reality of farms, and to reflect deeper on underlying issues. Thus, I phoned a few cousins and other colleagues and told them I was interested in their “inventivité” (inventiveness), their own way of doing things; I asked them to go and work with them in their own farm, in their daily activities -whatever it would be- to understand why and how they are looking to change their routines, i.e. for novelties. While agriculture modernization, its ‘science’, agro industries, cattle competitions, and CAP subsidies do not bring desirable future anymore -even no future at all-, “Les Indomptables” creatively respond to interstices – regime failures- with multitude of novelties, new projects, relationship and bridges with other spaces -incl. by creating new commons such as nested markets and spaces where they share experience and knowledge. My MSc thesis is about freedom to carry on projects toward a better society – multiple, diverse as our worldviews and wishes are. It is about peasants’ struggle for the right to make progress in the direction they want. This practice-oriented ethnography is aimed at studying repeasantization as self-organized development, i.e. studying how farmers actively connect local, available resources with their own activities and projects. In their struggle for freedom, “les Indomptables” keep moving and actually bring change by civil disobedience -e.g. 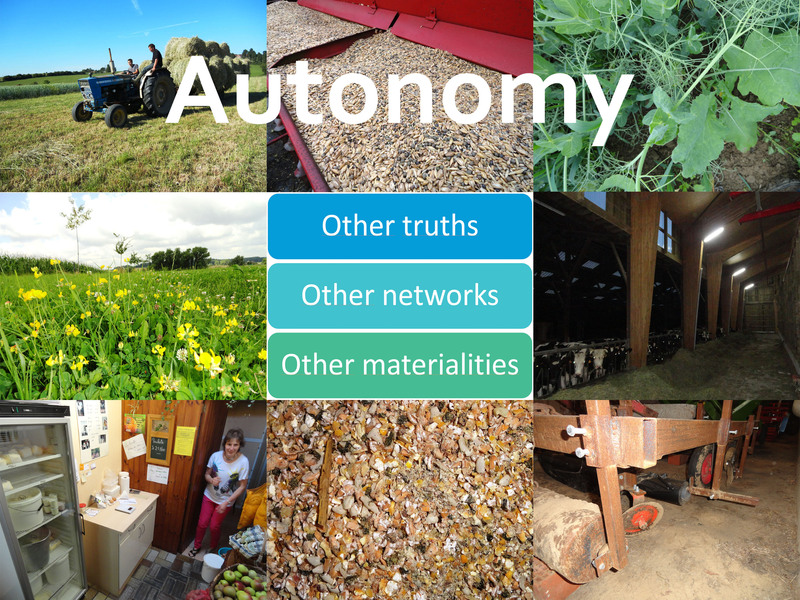 by not tolerating waste, “non sens”- and acting for more coherence between their own problems’ definitions and practices within farm spaces. By developing sustainable farming practices and creating rural jobs, they struggle to insert themselves in the future as legitimate and desirable part of tomorrow’s society. This entry was posted in Agriculture, RSO-student and tagged Agriculture, Common Agricultural Policy, learning and innovation, Les indomptables, Msc-thesis, novelty production, repeasantistion, Wallonia by RSO-Students. Bookmark the permalink.